What’s Your Social Media Dress Code? When I began the social media strategy at my school I had two goals in mind: 1. “drive” our many and varied constituents, e.g. parents, students, alumni, faculty, staff, and prospective students and parents, to our “official” school website where we have spent a considerable amount of time and money to generate, update, and deliver content which helps to reinforce our brand; and 2. engage each of these constituents in a conversation which would ultimately help to extend our brand. In order to do this I determined that a three-pronged approach was needed for us to be successful with social media. The three prongs that we use are: 1. “official” school website; 2. Facebook; 3. Twitter. After we launched our social media campaign I found that I needed a way of thinking about and describing our approach. After some trial and error I think I’ve come up with a memorable and effective way of discussing our use of social media and how, we as a school, think of each channel. As I mentioned earlier, we have spent a considerable amount of time and money to redesign and rethink our school website. We spent the majority of our resources on three main areas. The first area is the look and feel of our site which helps to define our brand; new pictures were taken, a new softer color scheme was used; and the layout of each page was made more simple to help to emphasis the most important content on that page. The second area where the school spent time was rewriting the content of each page. We didn’t want this website to just be a “face-lift” or version 3.1. We wanted the site to move from version 3.0 to version 4.0. Finally, the school focused to creating “portals” where specific content could be delivered to specific people depending on which constituency group(s) they were members of. The hope was to offer a more personalized and meaningful experience which would bring people back to our site on a regular basis. Should You Schedule Tweets For Your School's Twitter Account? With all of this effort and polish, I began to think of our “official” school website as Formal Dress. Everything about our site is professional and polished. The writing is good. The pictures were taken by a professional. The site looks good and it wants to be seen. It is our Formal Dress. I felt that Facebook was a necessary channel for our school to be a participant. We needed a Fan Page where we could engage our constituents and ultimately drive traffic back to our school website. As I began to “listen” to the interactions and content on Facebook I thought about the casualness and informality of the interactions ranging from quick, short comments to a simple “like” reaction to a post. As I began to generate content for our school’s Facebook Fan Page I started to think about Facebook as our Business Casual Dress. It would be a place where we could give people an insiders view, almost like reality TV. The pictures would be taken by a school staff member, students, or me. There wouldn’t be any retouching of photos and my hope is that they would be candid and not staged. Facebook was where we could seem more authentic by allowing our Fans to post information as well as comment and react to information that we posted. Our Facebook strategy would position itself somewhere between our school website and Twitter. The final prong of our social media strategy was Twitter. I felt that Twitter was another channel where the school should be a participant and that through the use of our school website, Facebook, and Twitter, we would have the best chance of reaching and engaging the most people. I also thought that Twitter was a level playing field where our school could connect and engage with anyone. (See my experience with this sort of engagement.) I, once again, began by listening to Twitter and trying to figure out what was being posted as well as how to use hash tags, URL shorteners, and how and why to use Retweet’s. I also began tracking my Tweets using Hootsuite which was very enlightening. What I found was that my more edgy, funny, mysterious, or pithy tweets earned the most clicks and retweets. It was after realizing this that I began to think of Twitter as Beach Attire. I think of Beach Attire as something that you wear among friends and is defined by it’s casual and comfortableness. What's The Difference Between A Blog And A Webpage? I hope you have found this helpful as think about your current social media strategy or as you embark on your initial foray into social media. I will be the first to admit that social media is not a one-size fits all endeavor and I would love to hear how you dress your social media strategy. Thank you so much for taking the time to comment and for sharing your ideas. Thanks also for pointing us to the branding guide. The one clarification I should probably make is that I didn’t intend for the “Dress Code” to be restrictive but rather as a fun way to think about different social media channels – more of a simple mnemonic device as we publish on our schools social media channels. I hope this makes sense. As a freelance graphic designer, I have worked with many companies. They all had what is called ‘Branding Guide’. I could design or publish any publication without following their Dress Code. I work for my district public school and we are creating a Communications Department, a department that has not been in existence for over 10 years. The first thing I did (after creating updated Mascots) created a ‘Branding Guide’ for all staff to adhere to. Below is an example of some idea to incorporate into your Branding Guide. Thanks for checking out my blog and thanks for the feedback. I really do appreciate your time. Wow, SchneiderB. This was an excellent post that perfectly captured my thoughts on company websites, as well as the Facebook and Twitter channels. 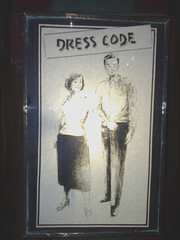 I never thought about saying it like a “dress code,” but honestly, that's pretty genius. Your company's website should be professional as possible (NOT boring! Just fine-tuned and well-groomed), your Facebook doesn't need to be at that level, and Twitter is even more casual and conversation. Great ideas, great execution, Schneider B.
I never thought about saying it like a “dress code,” but honestly, that’s pretty genius. Your company’s website should be professional as possible (NOT boring! Just fine-tuned and well-groomed), your Facebook doesn’t need to be at that level, and Twitter is even more casual and conversation.